The microscope and telescope were the most astonishing technologies of the 17th century. They revealed new and previously unimagined worlds, upsetting the traditional image of the universe and uncovering a dizzyingly rich and strange realm of tiny creatures. 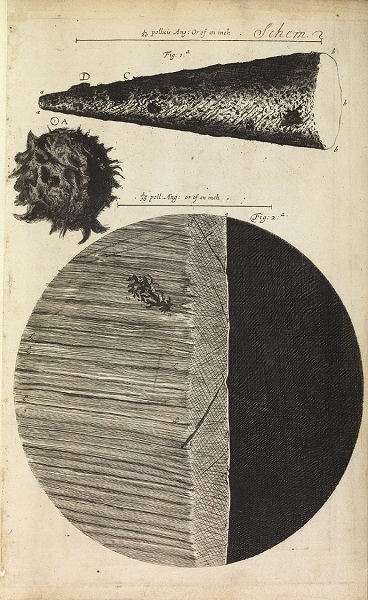 Robert Hooke’s Micrographia (1665) was the first fully illustrated text on microscopy. Its impact is clear from the excited response of the diarist Samuel Pepys. Pepys could not put it down: he stayed up reading it until 2am and said it was “the most ingenious book that ever I read in my life”. But not everyone was so impressed. Thomas Shadwell’s play The Virtuoso (1676) pokes fun at such enthusiasm. The “virtuoso” of the title is fascinated by the new science. But his relatives worry that he is a “A Sot, that has spent £2000 in Microscopes, to find out the Nature of Eels in Vinegar, Mites in Cheese, and the Blue of Plums, which he has subtilly found out to be living Creatures”. More seriously, he even risked his immortal soul through such trivial diversions.